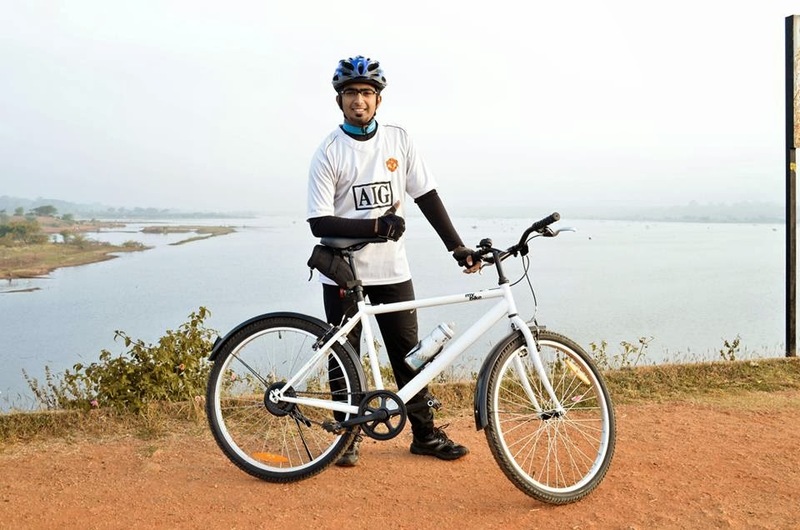 kadsur: 'My bike' - simple joy further simplified...!!! 'My bike' - simple joy further simplified...!!! i was always in search of simplicity. As such biking is a simple thing and a simple joy. As i started riding more and more i felt my search for it has ended. I did not feel that need for simplifying it further. 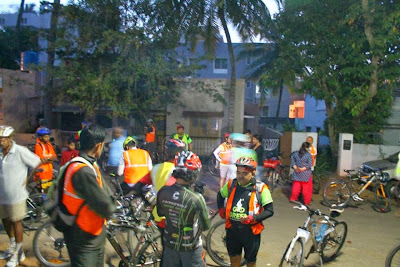 What happens from once you start moving from solo ride to group rides. Like all areas of life, we get infected or spoiled, we complicate things for ever. Need to get faster, stronger, climb better, sub 4 hrs 100 kms, from there to 100 kms in 3.30 hrs and sub 3 hrs, it never ends. Mtb to Road bike, Road to TT, then Carbon bike then lighter bike (rarely heard the discussion on light biker, only lighter bike....hehe) along with all this move from shoes to clip-less pedals, cleats, aero helmets, goes on and on and on, better not to get on to gadgets....The most simple thing called cycling has become extremely complicated!!! It has only added to the existing gap in the society. For me always the challenge is how do i not to lose my identity and if it all biking is a solution to modern traffic issues it has to attract masses (am not saying, "one can save Titanic with a bucket"....hehe). The tree planted in front of your house can always give some shade to you if not for the whole world. Then 'Mybike' from Decathlon got my attention. Picked up one from Sanjay on Nov 4th who was not using it. It is a simple steel bike coming in two colors, white and black. Stock tires are Ralson 26 x 1.95 and i swapped it to Continental tires (ie 26 x 1.75) of my another Mtb - Merida tfs 100. 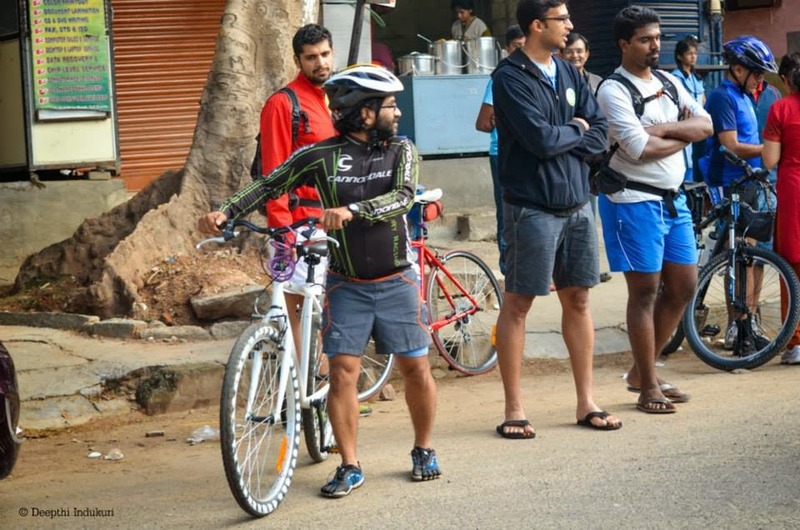 When some one wants to get on to biking, what always comes to their mind first is the pricing of the bike. Why does it really matter? Simple it is their 'belief'. And they also have the fear in mind how long they will continue this new habit? what should i do if i decided to dis-continue and the expensive bike lies in the garage or where do i go in search of a buyer (market place bots) or how much money i have to lose by selling it. When you are introducing someone to biking how many times we have time to give and support them with all the details. 'Mybike' is priced at Rs. 4,000. It beats lot of the above apprehension. It is a single speed Mtb. Crank set comes with 44 teeth and Sprocket 18 teeth. That makes it quite easy for city commute. That would be good gear ratio even for someone who is starting on biking. I wanted to explore this further, thought best is to take it on century or long rides. By that 20 or 30 kms round trip commute becomes negligible distance. 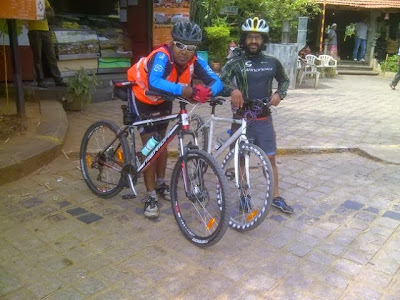 Nov 10th rode to Mysore along with one of my Inspiration in biking world in Bangalore Ashok Thiruvengadam who was taking part Mysore's first Brevet - 200 kms (who rode to Myore took part in Brevet and rode back). 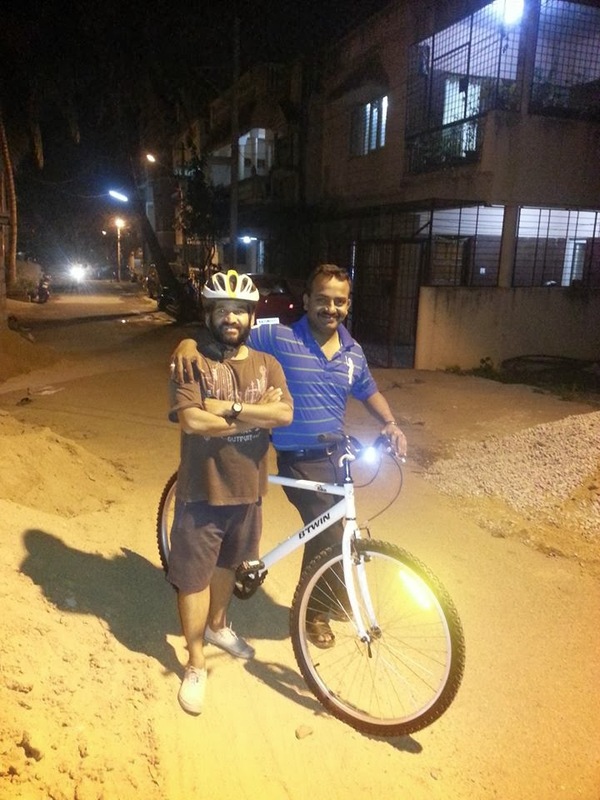 It was a night ride and first long ride for this bike which was just a week old. That turned out pretty good, no issues and it performed well. Took 7 hrs to reach Mysore including breaks. Felt that was a decent pace for the distance and considering it was night. Did one more night ride after that to Mysore and back with Ananth Vishwanathan on Dec 7th. This time again took 7 hrs to reach Mysore. Some where in between one of the days i took it out for 50 kms ride and did a PB on it, took just under 2 hrs to complete the distance. 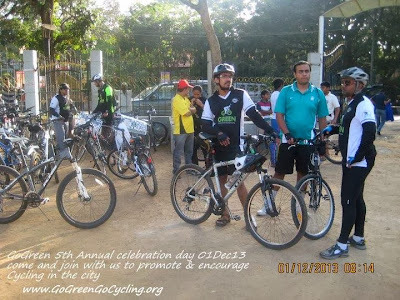 On December 21st again rode to Mysore with Hrishikesh -who was doing his first 300 kms covered the same distance in 6.15 hrs (ie 45 minutes improvement from the first attempt for the same stretch). 300 kms did it in 12.40 hrs with an average of 23.70 kmph. Wow... Beautifully penned your thoughts Anil.. Agreed that cycling is no more cheaper. Once we get into cycling the shopping list keeps increasing irrespective of necessity or comfort and status symbol!! Thank you. so true, i agree with you. Appreciate in taking time to read it. As the world is busy watching something else am busy riding my single speed. Nice write, Anil.. "That man is Richest whose pleasures are Simplest".. Simple and true... Richest in "ALL" aspects, though.. Thank you.....oh yah, i was bit bored of the complicated world. Thank you....it is surprising me too, it is exceeding all the expectations. Thank you buddy, appreciate you took the time to read. Really an experience to share. And a great achievement too. Prorbably you could update the post with difference between riding MYBIKE and any other geared bike. All the guys you mentioned, including you, are inspiring me. Cycle Day a Special one!! !